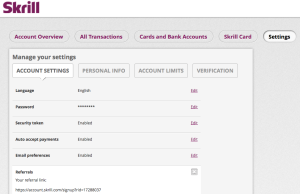 Our detailed Skrill review we show you how easily it is to set up and verify and new Skrill account. 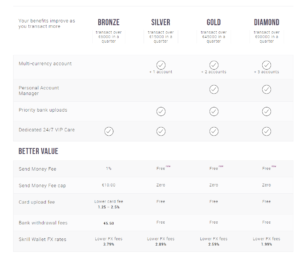 Additionally, we also give you more details about the benefits that come with a Skrill account like their VIP System, the Skrill MasterCard and much more. You will also learn how we can help you to optimize your Skrill account and which great benefits you enjoy by signing up with us. By signing up with our free Skrill eWO Bonus Program you receive a 15 USD welcome bonus (only for complete new Skrill customers! 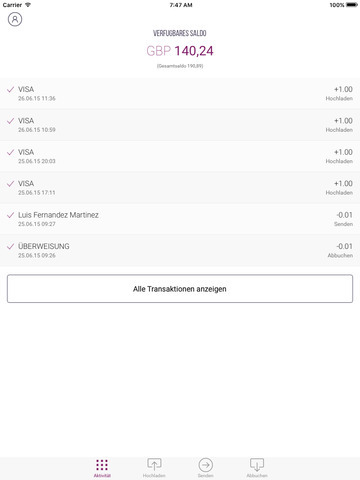 ), you will have lower VIP requirements to get upgraded to bronze VIP (only 3,000 EUR within 30 days) and silver VIP (only 5,000 EUR within 30 days) and you will also receive 0.3% cashback for all your outgoing transfers to Merchants. Besides that you benefit from our additional support. Through our longstanding business relationship to Skrill we are able to help you to solve most issues or at least speed up the processes for you. Accepted at poker-, sportsbetting- & Forex-sites. Fast & easy Support for VIPs. MasterCard only for SEPA Countries. Slow support for normal clients. Skrill is one of the oldest eWallet operators on the market. With 15 years (founded 2001) Skrill is one of the most recognized names on the eWallet market. They were founded under the name “Moneybookers”, took over Paysafecard in February 2013 and were re-branded to “Skrill” in March 2013. In August, Corporate venture capital (CVC) announced the acquisition of Skrill for 800 million USD. Skrill is regulated by the Financial Conduct Authority in the UK and is allowed to issue electronic money and payment instruments. The last half of 2012 we saw NETELLER achieve a 21% increase in new member sign-ups. Skrill (Moneybookers) was able to double their memberships to more than 35 million as well as their overall transfers to 55 billion EUR within the last 2 years. Skrill is widely accepted at most poker sites, sportsbooks, casino operators and forex providers and it is safe to say that there is no way around Skrill to be able to move your money around fast and easy between different merchants. Register your new Skrill account will only take a few minutes and by using the following steps you will create an account easy and fast. Make sure to use our signup link to sign up with Skrill. Enter your personal details like name, residential address, email address, password on the registration form. become a member of our bonus program. After these steps your account is almost ready. The last step is the verification process, which is necessary to remove all restrictions and enjoy all our benefits. You already have a Skrill account and you want to join our program with your existing account? Just submit your account details. We will be happy to check if we can get your account added to us as well. Existing Skrill customers can also apply to join our free Bonus Program. Just submit your data at our website and we will be happy to check and get back to you via email. 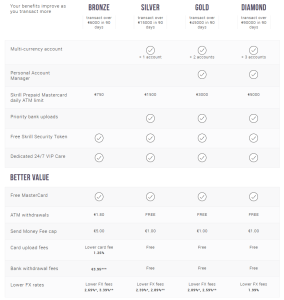 Only a fully verified Skrill account can enjoy all of Skrill’s services without any restrictions. So it is important to verify your account to enjoy our monthly bonuses, lower VIP requirements and also remove all transaction limits from your account. a selfie of your face holding a handwritten note with “Skrill” and the date of the verification process next to it. a recent utility bill (gas, electricity or any other household bill) or a bank statement, showing your full name and address and not older than 90 days. Please make sure to send clear and legible copies of your documents to ensure a fast verification for your account. Security is an important topic in general, but especially for eWallet customers it is even more important to keep your funds as safe as possible. 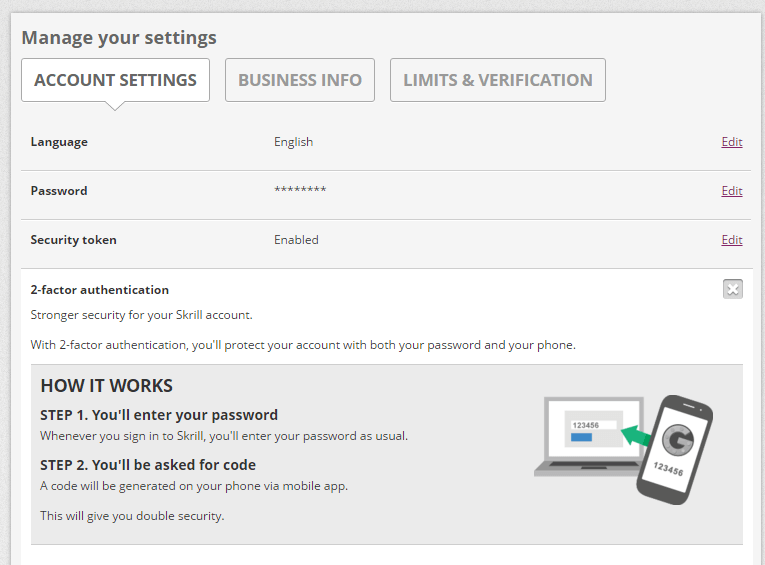 Skrill offers a great in-house security feature, which helps you to secure your account. Every time you sign into your account or make a transaction your smartphone or tablet will generate a one-time-use code. This code comes in addition to standard login details and changes every 30 seconds. This makes it almost impossible for someone to break into your account. In combination with strong password you have a really safe place to keep your fuds. You can find a quick step-by-step guide about how to set up this additional security feature on our Skrill Security page. Skrill also offered a hardware security token to protect your account. This token is no longer available and was replaced by the two-step authentication. However, customers who still have an old token are able to use it. There are also a lot of Skrill phishing on the web, so make sure to check our Security Article about this topic. You will find some more details about how to detect those sites and some general information about your security. 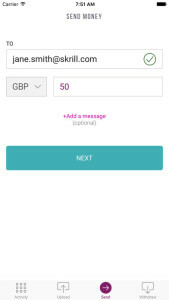 Skrill offers a realy simpel and straightforward VIP system. With this reward system you can get rid of most of your fees or at least lower them drastically. → only 3,000 EUR with eWO! 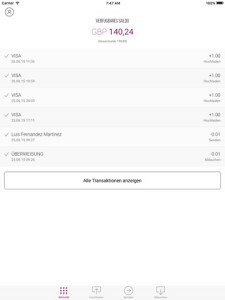 Transfer 15,000 EUR to merchants per quarter. → only 5,000 EUR with eWO! Transfer 45,000 EUR to merchants per quarter. → only 15,000 EUR with eWO! Transfer 90,000 EUR to merchants per quarter. → only 45,000 EUR with eWO! 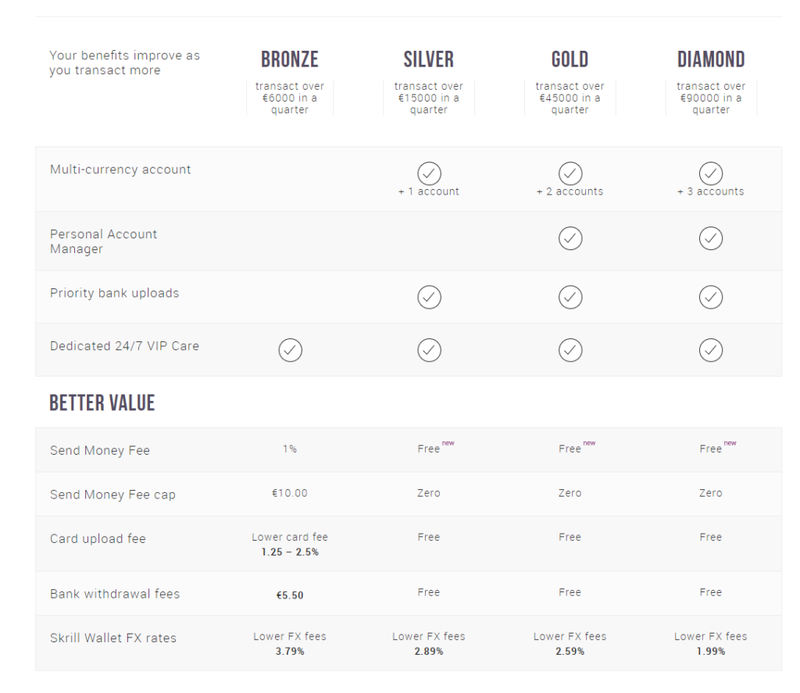 To see a full list of benefits, please check our Skrill VIP Progam page. Please note, as a eWallet-Optimizer client you will enjoy lower requirement for get upgraded to bronze and silver VIP. 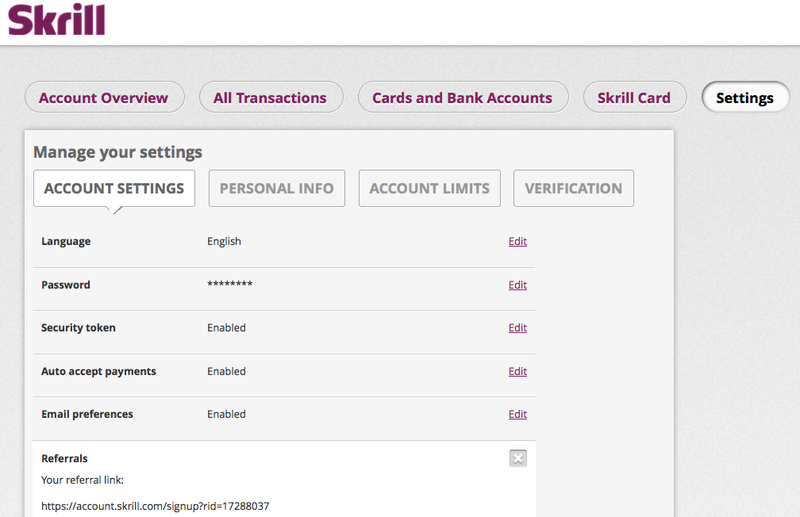 If you already have a Skrill account, just submit your account details. The Skrill MasterCard works like every other prepaid MasterCard and is the perfect way to get access to your Skrill funds fast and easy all over the world. You can access your savings without worrying about spending too much money. Your available balance with the prepaid MasterCard is the same as in your digital wallet. 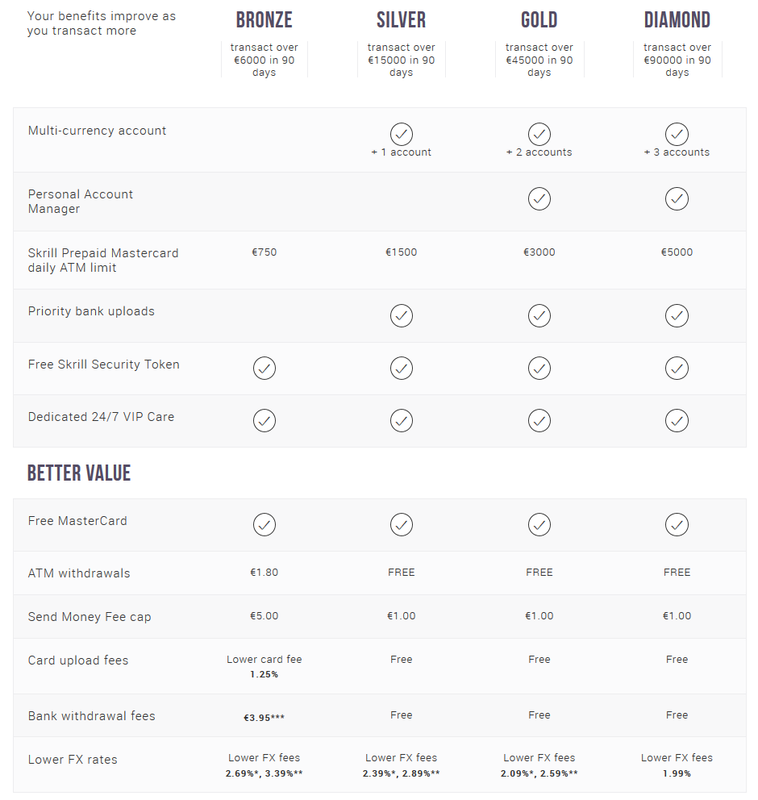 Compared to other eWallet providers the fees for the Skrill MasterCard are very low and Silver VIPs or higher can use the card for free without paying any fees. The extreme popularity that mobile devices like smartphones and tablets enjoy is really impressive and therefore it is important for a company to offer an easy to handle and comfortable mobile app. That’s the reason why Skrill decided to launch their mobile app at the end of 2013. The Skrill app allows customers to manage your eWallet account and send and receive instant payments to anyone, anywhere and at any time. You can also check your account balance or upload your verification documents through the app directly. The Skrill mobile app is available for free on Android and iOS platforms and can be found in Apple app store or Google Play store. For more details please check our Skrill Mobile App page. Please note, depending on your country of residence the fees for the different options can vary. Make sure to check the fees for your current location before making a deposit. In addition you can also use your Skrill PrePaid MasterCard for ATM withdrawals and send money via p2p transfer to another Skrill account. If you have done some research or used Skrill yourself, you might have noticed their Support is not particularly good. They have only a 1.5 score out of 10 on Trustpilot. But do not worry: If you are a member of our Skrill Bonus program we can help you solve any problem that you might have. 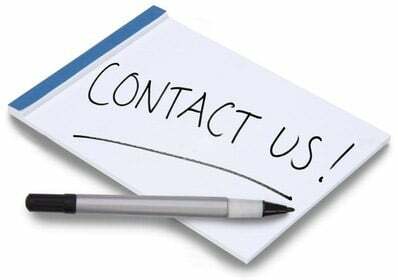 We will contact the right person in Skrill and make sure it is solved in a timely manner. Please do not hesitate to contact us if you have any issues or problems with Skrill. We are there to help! Skrill accounts are serviced almost all over the world. There are only few countries which are completely restricted. The Skrill Prepaid MasterCard is only available to customers in the SEPA region.